Location: About 8 minutes in, there is a quick shot of the entrance to Hollywood Park Race Track. Submitted by Eric Cooper, 21 May 2010. Sightings: From the back row of the grandstand, uncredited actor Bert Stevens and the ubiquitous �Miss Carmody��enthusiastically watch Tiger Lil in her first race. In subsequent races, only Stevens turns up. Distinguished Lady #2 might be the jail matron. Courtroom spectators include Quiet Old Man #1 and possibly Distinguished Gentleman #1. Submitted by gracep, 15 January 2011. Location: I can't say for sure, but based on the power lines in the background which I believe are at Reseda and Lassen, I think the ranch featured in this episode is part of either one of two farms that raised thoroughbreds. Barbara Stanwyck and Zeppo Marx jointly formed the 140 acre Marwyck Ranch. (Later it was sold to comedian Jack Oakie.) Their ranch started at Devonshire and Reseda and continued toward Lassen. However, since the land is flat here and the power lines look very close I�m going to say this is Marwyck Ranch, named by combining the last names of Barbara Stanwyck and her agent Zeppo Marx. William S. Hart was also a partner on this 127 acre ranch. Marwick included a 6 furlong (3/4 mile) thoroughbred training facility with stables. Submitted by Eric Cooper, 27 July 2011. CARS. (1) Jennifer Wakely's 1959 Ford Fairlane 500 Galaxie Sunliner, light color, (rag-)top down, Licence No. RUA 051. Remember, Perry's '59 Skyliner was a "Retractable HardTop". (2) 1940-1954 Pirsch Open-Cab Pumper, FIRE ENGINE No. 928, pump capacity 750-1000 gal/min. Identifiable by the 40s/50s Pirsch hood-vents & grill. I believe that the same truck appeared in Perry Mason ep#6 and perhaps in The Fugitive, Beaver, Menace but not Rescue 8. Here is a 1981 article about Pirsch. Alas, the last Pirsch was built in 1987. (3) white 1962 Buick Invicta Estate Wagon (4-door station wagon), seen briefly @ 5:21 parked at ranch. Roberta's or Joe Mead's? (4) Perry's black 1962 Ford Galaxie 500 Sunliner, top down, Licence No. XCF 015. (5) 1962 Chevrolet C-10 Fleetside Pickup, Joe Mead's work truck. (6) 1962 Buick LeSabre 4-Door Sedan, medium color, George Tabor. (7) Paul's black 1962 Thunderbird Convertible, top down, XCF 016, Comment below. 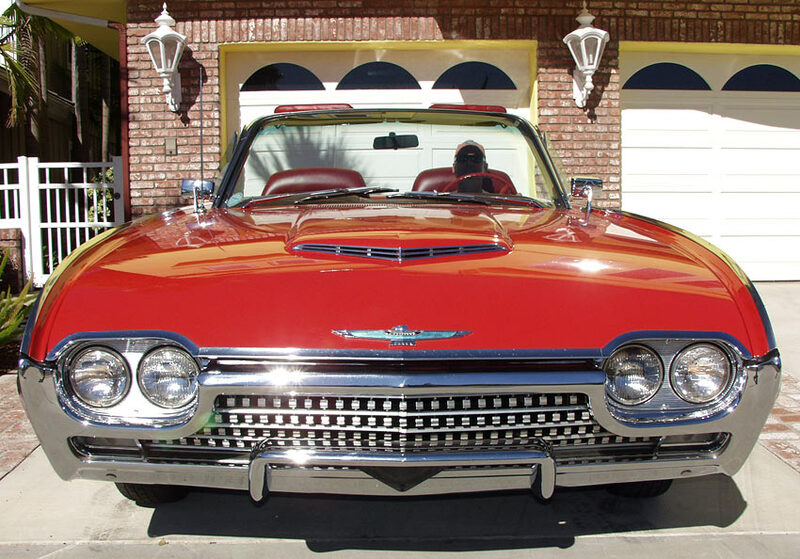 Paul's '62 TBird first appeared in ep#143, Perry's '62 Sunliner in ep#147. Added by Gary Woloski, 6/30/13.